Conservationists have vowed to fight plans to extend quarrying near one of Britain's most important archaeological areas. 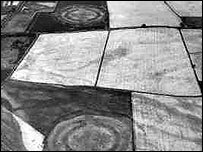 Nosterfield sand and gravel quarry near Ripon is close to the Neolithic and Bronze Age site of Thornborough Henges. John Lowry, chairman of the Friends of Thornborough Henges, believes there can be no compromise over its future. But quarry owners Tarmac Northern says the site faces closure if the extension does not receive the go-ahead. Tarmac Northern employs 15 full-time people and the proposal will guarantee the quarry's future for another four years. The planned 45-hectare extension is in an area known as Ladybridge Farm and is expected to yield two million tonnes of sand and gravel. Bob Nicholson, estates manager for Tarmac Northern, said archaeologists will be at Ladybridge Farm when the initial digging begins. He said archaeological analysis have revealed little so far, but a number of discoveries have been made at the current quarry. "We found a body, a skeleton. It is being radio carbon dated at the moment, it could range from Neolithic right through to medieval," said Mr Nicholson who also listed pottery and four horse burials among the finds. At its nearest point, the quarry extension will be 600 metres away from Thornborough Henges, which has been dubbed the Stonehenge of the North. But campaigner Mr Lowry believes the area surrounding the monument is just as important. "Our main problem is the quarry is right in the middle of valuable archaeological remains and they are just quarrying through it," he said. He wants the plans, currently before North Yorkshire County Council, stopped and controls put in place to safeguard the area's future.